All of our horses are related in some way or another. Sugar is the mother of Noah and Sunny. Sunny is one of Brave's daughters, Mercy is also. They are all APHA Paint quarter horses. Noah, Brave, Sunny and Mercy are all Tobiano Paints. Sugar and Reyney are Overo paints but without enough white so they are called "Breeding Stock." Brave is the father of Sunny and Mercy. He has been so faithful and our main lesson horse. He has a slow and steady temperament. He is good with all ages. He has a willing attitude with the many different types of riders that come to the ranch. Here is Noah, who was born during an El Nino year. On his birthday the sun finally came out and there was a rainbow, thus he got his name. He is a Sorrel Tobiano Paint. Noah is a clown; he is always into something usually being mischievous with the other horses. He is fun but he takes a rider who is confident and has learned to relax and gain control while riding with a good seat. He is for an Experienced Beginner-Intermediate. Sunny is a favorite of many on the ranch. We thought she was a Palomino Tobiano Paint but with color genetics getting more defined we are thinking she might be a Dun. She is Brave's daughter, a real sweetheart. Being very curious, she will follow you around wondering what you are doing. Sunny is very athletic and has more energy than her father, yet she has some of his great qualities. Riding Sunny is a lot of fun and likes to have a job when she is being rode. She makes a great addition to our lesson horses. She will be for our Experienced Beginning-Intermediate student. She is turning out to be one of our favorite lesson horses. She loves to walk, trot and lope. Reyney was adopted into our family. 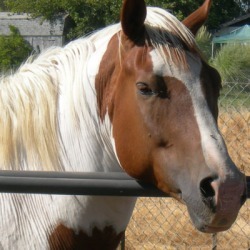 He is a Black and White Bald-Faced horse who is a Breeding Stock Paint, like Sugar. Reyney came from Oregon where he was born on 300 acres and roamed with his mom, among cattle, other horses, and other wildlife. Reyney can run like the wind, and jump over obstacles. He is very quick much like a horse from the wild. 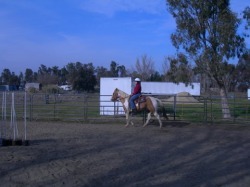 He has very quick reaction and instincts that are much different than our other hand raised and humanized horses. His dad was from this area, a fine horse. The Paint stallion owner's purchased some unregistered mares to try and prove his color. 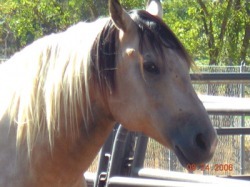 They took the broodmares to Oregon to let them foal on the 300 acre ranch. We found Reyney when he was 6 months old at a nearby stable where we were boarding for a short time. Reyney had just made his way back to California and when we saw him. We consider him our little rescue horse, as he seemed to have been left to himself and needed a lot of attention when we found him. We brought him home for a small fee and have raised him up to be a fine young horse. Reyney belongs to Steve, and he has done a nice job raising him. His training is ongoing. He is eager to please and has a gentle temperment. Steve is building a solid foundation and continues to progress in Reyney's training. Steve has really enjoyed raising and working with Reyney. It is giving him the opportunity to increase his skills while training Reyney from the ground up and feels the partnership between them growing. 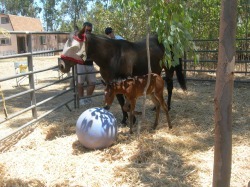 He is realizing the benefits of imprinting foals at birth and the trust that is formed. Reyney didn't get this opportunity and thus, he has some trust issues that the other horses haven't had to deal with. 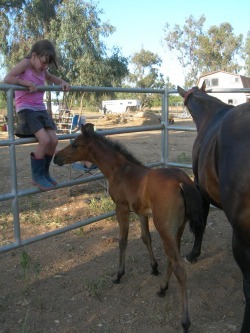 November 3, 2009 we purchased an awesome little maiden mare named Faith. While feeding her through the months we thought we were overfeeding and cut back. Even though she looks like a horse...she is a Quarter pony. If overfed they can founder. Even with a smaller ration of feed she continued to get bigger. On June 6, 2010 we noticed her large belly was more on one side than the other...and thought we saw movement. It was then we realized she was pregnant. So our little ranch blessing, JOY, arrived on July 6, 2010 at 10:30 p.m. Steve and I were able to be there for her birth and Steve got to imprint her before she stood up to meet her Mom and world. This bond has caused her to be very friendly and trusting of us. We enjoy her and she has brought special times to our day...as she nickers to us when we come into sight on the ranch. She puts a smile on our face and has been a source of fun and laughter watching her little personality as she grows.